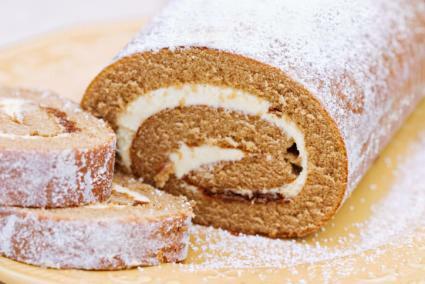 A pumpkin roulade, or cake roll, makes a delicious, moist dessert. Sweet, earthy pumpkin pairs really well with tangy cream cheese. With additional spice, this simple dessert is the perfect finish to a meal. Make this moist cake with canned pumpkin purée. The spices add an extra element of sweetness and flavor to the roulade. Preheat the oven to 350 degrees Fahrenheit. Grease a jelly roll pan. Line the pan with parchment and grease and flour the parchment. In a large bowl, sift together the flour, baking powder, baking soda, salt, nutmeg, cinnamon, ginger, and cloves. In another large bowl using a hand mixer, or in the bowl of an electric stand mixer, beat the eggs and sugar on high for three minutes. Turn the mixer to low and add the pumpkin. Add the flour mixture in 1/4 cupsful, using a rubber spatula to mix until it is just combined. The dough will have a few floury streaks in it. 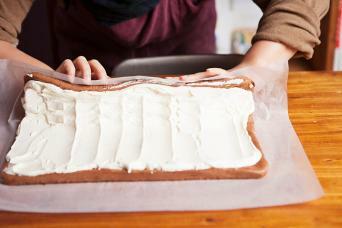 Spread the cake batter on the prepared baking sheet, using a spatula to smooth it. Bake until a toothpick inserted comes out clean, 10 to 12 minutes. Lay a cotton towel on the counter and spread the powdered sugar evenly over the surface. When the cake comes out of the oven, run a knife around the edge to loosen it. Invert the cake onto the powdered sugar-covered towel. Peel away the parchment. Working lengthwise, loosely roll the cake and towel up into a roll, and let it rest on a wire rack. Allow the cake to cool completely before proceeding. Once the cake has cooled, it's time to add the filling and roll the cake. In a large bowl using a hand mixer on medium or in the bowl of a stand mixer, beat together the cream cheese, 1 1/4 cups of the powdered sugar, cream, and vanilla until it is well mixed. Spread the filling evenly along the top of the cake. Sprinkle it with walnuts. Roll the cake into a tight spiral, rolling it lengthwise from one end to another. Trim any edges so the ends are square. Put the cake on a platter seam-side down. Put the remaining 1/4 cup of powdered sugar in a wire sieve and sprinkle it evenly over the roulade. To serve, slice the cake in one-inch thick slices across the width so the filling shows in a spiral across each piece of cake. Dust with additional powdered sugar and a sprig of mint for garnish. Use a serrated knife and use a gentle back and forth sawing motion without applying too much pressure. Dip the knife in warm water before you cut to keep it from sticking to the cake. If you wish, you can freeze the roulade for about an hour before slicing. This will make it easier to slice. Pumpkin roulade with cream cheese filling is the perfect sweet, lightly spicy end to any meal. The next time you want to impress your guests, try this simple yet delicious dessert.